2 BIGHEARTS. ONE BIG MISSION. Through exclusive research initiatives and ongoing education, 2 BigHearts works to raise awareness that heart disease is the #1 health risk to women, with the ultimate goal of changing healthcare industry policy and make the most comprehensive cardiac testing the standard for all women. Could you imagine your wife and her sister dying on the same day, 90 minutes apart, both from the same undiagnosed heart condition? Not in my wildest dreams could I have fathomed something so tragic and world-shattering. But yet it happened. And from my greatest loss in life has come my greatest gain: the 2 BigHearts Foundation. Thank you to all those who support our amazing cause, helping us tell the story of Gigi and Sally, and helping us get the message out that heart disease kills more women each year than any other disease — 10 times more deadly than breast cancer. 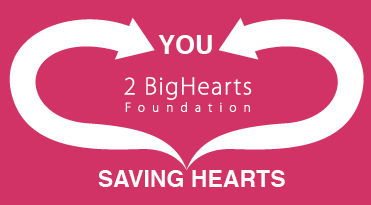 For those who have yet to get involved with 2 BigHearts, the uniqueness of our effort lies in our free heart screening program, which can detect silent heart conditions like the one that took the lives of my wife and her sister. The data we’ve collected since 2004 has been shocking, suggesting that heart disease exists in a significantly higher number of women than conventionally thought. We use our eye-opening statistics to rally all women and the entire healthcare community against this preventable disease. Our vision is to see the 2 BigHeart’s-style screening recognized as the industry standard and be made available to all women at their annual check-up, even those without symptoms. We urge you to get involved. To all those who participated in our 10th 2 BigHearts 5K Run/Walk in Long Beach, IN, thank you for continuing to support the 2 BigHearts Foundation. and photo gallery are here! Since 2004, 2 BigHearts has proudly funded more than 1,600 1,974 highly comprehensive heart screenings to women, at absolutely no cost to them. Unlike a typical visit to a physician’s office, our heart screenings include a resting echocardiogram, which can detect nonsymptomatic heart conditions, like one Gigi and Sally had. Our results have been profound, confirming our nation’s worst fears on obesity, elevated lipids and, most amazingly, that an unusually high percentage of women have evidence of a tendency for heart disease.